Air Force Station Ojhar Nashik (Air Force Station Ojhar), Ojhar Published Job Notification for Part time Medical Professionals Posts. 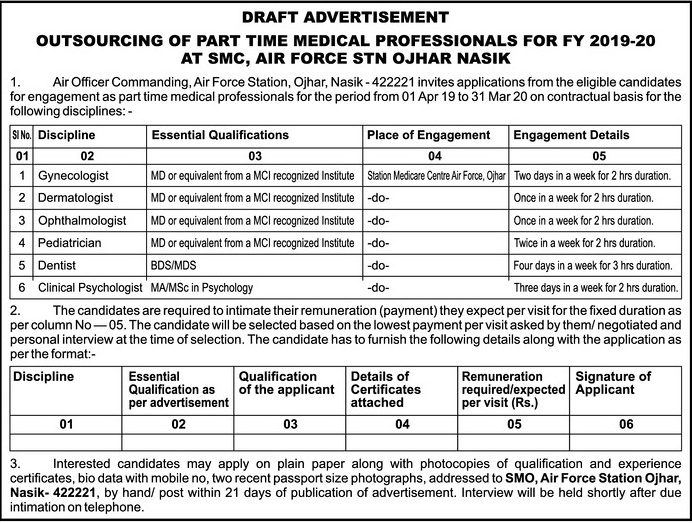 Candidates who wish to apply must look at Air Force Station Ojhar Nashik Part time Medical Professionals Recruitment 2019. Eligible candidates can apply Offline before 10-04-2019. Interested & Eligible candidates can send their application along with all the necessary documents and testimonials to SMO, Air Force Station Ojhar, Nasik – 422221. Starting Date, Last Date to Apply Offline at Air Force Station Ojhar which candidates should be remembers as follows. Start Date to Apply Offline: 20-03-2019. Last Date to Apply Offline: 10-04-2019.